We are the Gallery that walks. We are the Patients that wear our stories on our backs. Soon we we shall to come to a city near you and and create gallery space in moments. We won’t pound a single nail into the walls to hold the art. Dozens of people will walk into a space wearing business jackets or doctor’s lab coats. That alone is not unusual. But these jackets will be works of art. 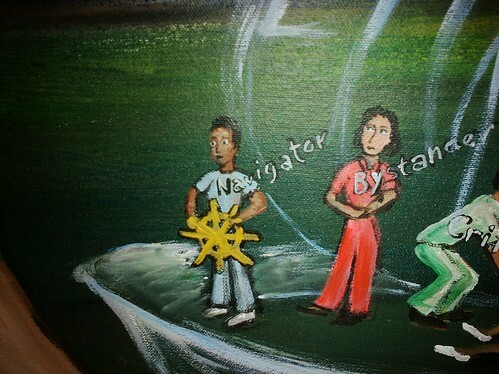 Each one shall be painted with the story of a patient or an element of medical advocacy by me or another artist. These masterpieces will be worn on the backs of government employees, technology gurus, medical professionals, social media activists, CEO’s of companies and artists. It shall be a great meeting of the minds. 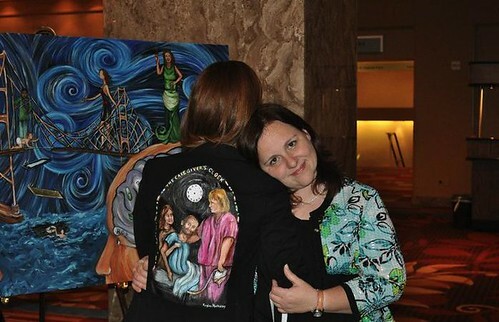 The Walking Gallery exists because Jen McCabe followed me on Twitter on May 30th 2009. That was the day before I placed the Medical Facts Mural in Pumpernickels Deli on Connecticut Ave. That was a day when my Fred was still alive and could speak and eat again because of the wonderful care he was receiving in Washington Home Hospice. Jen was one of my first followers on Twitter and is such a glorious spark of life. I finished the second mural “73 Cents” on September 30th 2009. It was my feverish obsession in the weeks after Fred’s death. “73 Cents” was a thing that I had to do. It soothed my soul; it spoke to me and calmed my aching heart. It gave me a reason to leave the solitary confines of my mind and my widowhood. It gave me permission to stand on the street and talk with complete strangers about the grief roaring within me. I often go to social justice events and hear about the chronically homeless on the street. I hear workers complain that they find small single apartments for these folks to live in, but instead many return to the street. It is hard to be alone when sadness is engulfing the mind. The street is alive, and there the broken congregate and help each other. Each day I painted I made many new friends, but those who came back and spoke to eye to eye were often the most dispossessed and the homeless. 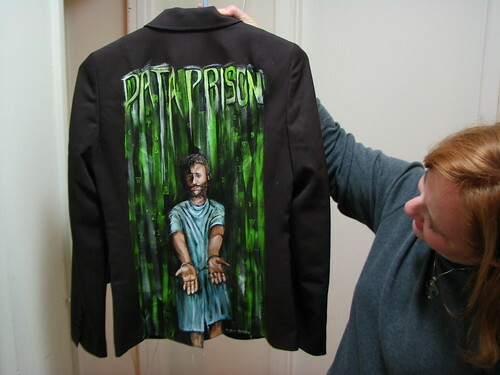 Without Jen’s suggestion that I paint jackets, I would have gone home, my Magnum Opus done, to loneliness and grief. Yes, I was still blogging, but that was not enough. I had to paint. I had to spread the word through art. 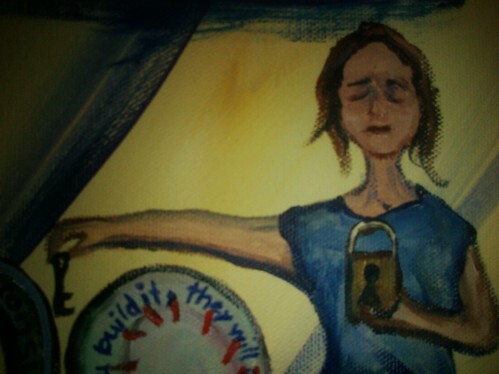 Jen had provided a new “wall,” and that wall could walk into the Mayo clinic or the National Board of Medical Examiners and remind everyone of those patients who suffer in a system without real time data access. “First Responder” on January 12th 2010. Due to Jen’s very public appearances wearing patient advocacy jackets, two other thought leaders would contact me to obtain images they too could wear. Chiara Bell from Enurgi, later to become part of Univita Health, would ask to have a jacket of her own. She wanted to show the importance of the caregiver in patient care. 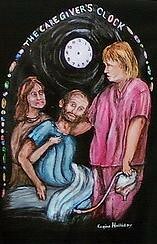 I made for her the “Caregiver’s Clock” a painting that depicts both the family member as caregiver and the professional caregiver caring soothing the terminal patient. 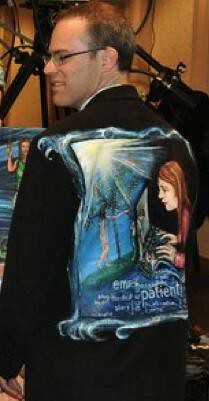 So, that is the story of five jackets that I painted to spread awareness. Five jackets. They bring the “patient” into the room and onto the panel, when no patient was invited to attend. They remind me of the encaustic mummy paintings from 1st century CE found in Egypt. These amazingly real and poignant faces stare out above dried sinew, wrappings and bone. Their eyes sear our souls and remind us, I was once one of you who lived and played, who laughed and loved before I met this fate. They transcend the dust and the darkness of the ages, and make the lives lost long ago so very real. The jackets worn by these brave few do the same for data, and pie charts and graphs. When you sit in an audience listening to a power point presentation, and the faces on these jackets stare back at you; it changes things. It adds an edgy sense reality to dry recitation of data. It wakes you up. So… CALLING ALL JACKETS! CALLING All ARTISTS! I need your jackets, I need your stories. I need other artists who would like to join a movement. Never let anyone tell you, that you do not have a voice. Step up and Speak out. We get great change by doing great things. You will be surrounded and loved by others just like you. It shall be a great fellowship of those deeply invested in patient empowerment. And then you shall go forth and wear your jacket at other conferences spreading the word about the importance of patient data access and truly patient centered care. And sometimes you will be the only “patient” in the room. But you will be brave and you will be proud, for you are a member of The Walking Gallery. Have you ever worked a flea market stall? I did for many years as a child. At the flea market we accept all sorts of folks. It is sort of like a carnival or fun fair. We put on the show, sell product to the marks and do not bat an eye at the deformed among us. I worked flea market back in the seventies and eighties. This was years before the Americans with Disabilities Act would be signed into law. Each weekend we would serve customers that rarely frequented traditional shops and establishments. All were welcome to roll a wheel chair onto our concrete slab where there was no small doorways to impede their course. And I would talk about Frankhoma pottery with a woman covered in severe burns or haggle about the price of shovels with the man whose face was a ruin of boils and warts. These daily scenes informed my childhood and taught me about the vast array of individuals who live within our world. I felt honored to help those who had suffered so. Later in life, I saw the 1932 film Freaks with my husband Fred. It is considered by many to one of the most disturbing horror pictures ever made, as the director Tod Browning used actual circus freaks to perform various roles in the film. The film itself is endearing and disturbing in turn as the audience sees daily life in the world of a carnival. In an important scene within the film there is a wedding feast for the midget Hans and his fiancée Cleopatra the trapeze artist. As Cleopatra is a “normal” the freaks sing an initiation chant to her as they accept her into their ranks. The assembled mass of the disfigured and deformed raise their glasses in a toast of “We accept her! We accept her! One of us! One of us! Gooble gobble, gooble gobble.” Cleopatra does not take kindly to this welcome and throws wine in the faces of those assembled. 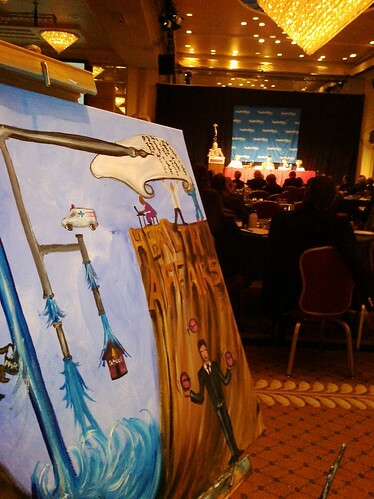 Last week thanks to an invitation by RTI’s Cindy Throop, I had the opportunity to paint onsite at the RTI Forum “Patients as Partners in Care: Engaging Patients through Health IT” at the National Press Club in Washington DC. As I set up my easel and began to depict the things I heard swirling around me, I thought of those long ago flea market days and the carnival in Freaks. My past informed the present and I began to depict the concepts that the various speakers presented as acts upon a carny stage. This is One of Us. One of Us. It reflects my impressions of a HIT panel that included not one, but two patients. 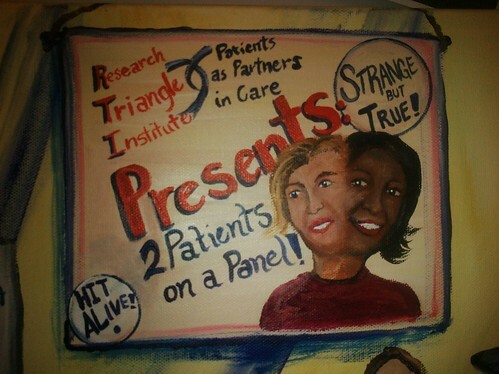 In the center of the painting hangs a vintage side-show poster promising that, strange but true, RTI would have two patients on their panel. This is depicted in an over-the-top fashion by using a two-faced woman combining the faces of Donna Cryer and Ann Barlett. 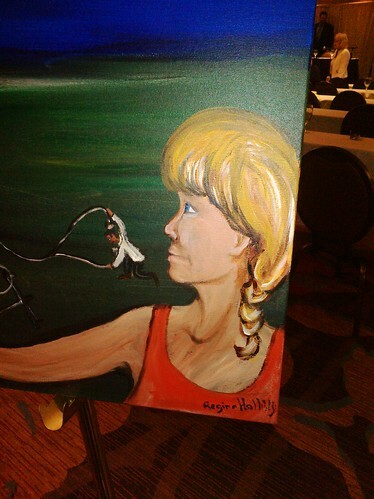 Both of their speeches were so powerful that they almost overwhelm the painting. From Ann Bartlett we learned about the challenges of being diabetic and balancing life and a chronic condition. She also informed me of the power of massage in treating everyone from athletes to terminal patients. 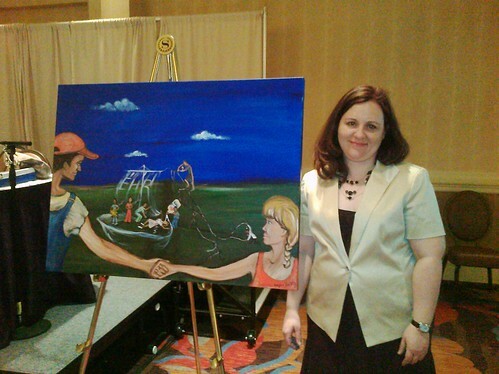 Her heroic form stands in the front of the piece providing a massage to a cancer patient. Ann is depicted in a gaping patient’s gown as she continues to provide care to others while she herself is a patient. Her patient/client is perched on the seat of a massage chair, as the client’s head rests upon the shoulder of a child. This is the child Donna Cryer. 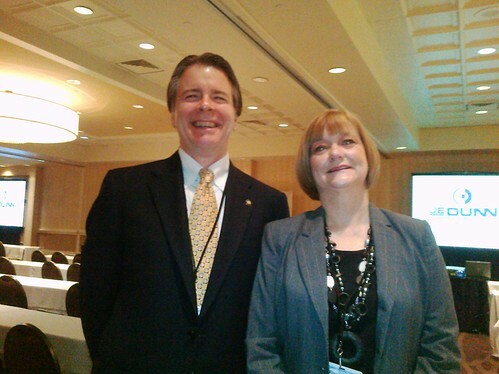 Donna Cryer is a well known speaker and patient advocate that blogs and tweets as DCPatient. She is a liver transplant recipient and is well-versed in the challenges of providing chronic care. She presented a speech about busting myths about patients. Her speech was powerful and concise and focused on five myths. I depicted this myth as two snakes twinned around each other. One is labeled patients, one is labeled consumer and an equal sign connects them. Together they form a type of caduceus. There have been many arguments in the world of e-patients about the nomenclature in discussions of patient terminology, but I must admit that I agree with Donna these terms are not the same. To use the word consumer instead of patient relegates the role to one of commerce, when the word patient means so much more than just a transaction. This path is very similar to the one the caduceus itself took. The twinned snake is an ancient symbol representing the dual nature of man, the sexual power of woman and man combined and the tantric points of the spine. Through years and cultures this symbol came to represent the God Hermes and eventually Mercury in Roman iconography. It became equated with a God who was a guide for the dead, who protected merchants, liars, gamblers and thieves. This became a symbol of commerce instead of a symbol representing the whole of man. The two meanings are not interchangeable. I depicted this myth with the baseball from Field of Dreams. Baseball is an amazing unifying force within the history of the US. It united fans of all economic backgrounds and became America’s pastime. EMR venders should remember the lessons of the past. For a good game of ball everyone must be invited to the field, and all of us must have a role. I went to the site, and at the top of the page you can click on a large link field with a picture of a stethoscope labeled Information for Providers or you can click on a field with two faceless Caucasian avatars labeled “Information for Consumers”. On the provider side you will learn about the importance of accurate patient data, the power of CPOE and CDS and the money saved by implementation. You will see that CMS has incentives tied to implementation. You will see the ONC is available to help you. You will find out about REC’s, HIE’s and Beacon Communities. There are 22 active links on this page that will lead you to hundreds of other links that will explain the legislation and process more fully. But if you hit that faceless link for Consumers you will see two Paragraphs. The first is a very brief overview of the power of EHR’s to improve medicine. It has one active link to a dead end pdf explaining EHR’s more in depth. The next Paragraph is about Privacy. If you hit that link it will lead you to a page entitled, “Privacy and Security.” This page contains 20 links to various white papers and Pdf’s about privacy in relation to the EHR. Has comparing two links on HHS page ever made you cry? It made me cry. It made me cry to see so little was expected of patients. On those pages it seems as though we are only consumers worried about privacy and security and little else. It seemed our research paths are one way communication only and not open to discourse. So in the painting of this myth, I depict a patient with her face contorted in pain as she tosses away the key to a lock beside her heart. She is so much more than privacy and security. Here, I depict this lack of data input of another form of CPOE “computerized patient order entry” in the electronic medical record, as one of those don’t touch signs. As a parent I have frequently been in shops with my children, where a concerned shop-keep has posted signs throughout warning off the children. 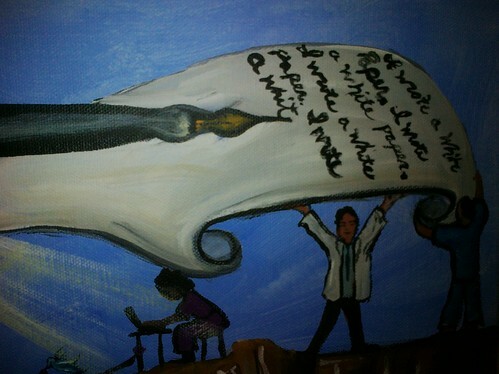 The sign in the painting states “EMR: Visitors should look but not touch.” Here is that paternalistic statement heard by many patients that we have nothing of value to add to the EHR, but due to months of effort, lobbying and legislation we can finally see some of what is written about us. Yes, we want to read all that is written, but we want more. We want to be viewed as a valuable part of the medical team. Just as the whole notion of e-patient activism has come under fire for being the domain of only an elite segment of tech-savvy individuals, many claim that HIT does not serve low income or minority populations. Did I mention that DCPatient Donna Cryer is not only a patient speaker, but that she is an African American Woman Patient Speaker? She stands before us all exploding the myth that HIT is only for an elite group. Within this painting a Caucasian blond woman in mink coat, blue tooth in her ear and a Gucci style handbag strides importantly away. That handbag is marked HIT. That is the image of the e-patient that many people in the EMR industry and the world of medicine think of when they talk of the HIT tech savvy, and it is very wrong. Due to tools available through mobile health, access is becoming far greater for minorities, the under-educated and the poor than ever before. 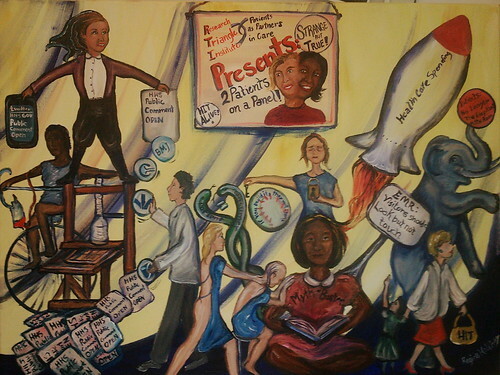 Next to this myth-busting scene, An elephant proudly balances a ball upon his trunk marked “Patients: No longer the Elephant in the Room.” An amazing stride forward had happened at this RTI event as Donna and Ann were accepted as equals to the providers speaking on the dais. 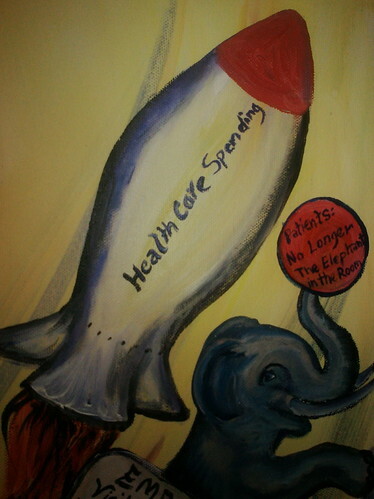 Beside the elephant is a health care spending rocket that careens into space. This was the first archetypal image to be depicted within this painting. It is the words of Senator Whithouse from Rhode Island as he said we must get in control of our health care spending. This rocket is placed on the patient side of this painting for a reason: patients are the untapped resource that can help contain costs. 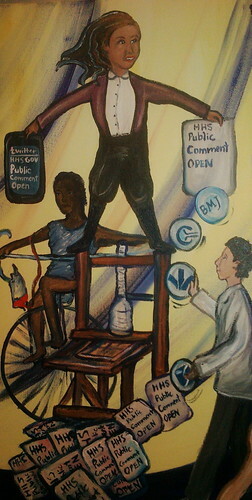 On the left of the painting, is a triangulation of the relationship of government/technology with providers and patients. Above the crowd stands Lygeia Ricciardi, Senior Advisor for Consumer e-Health, Office of National Coordinator, Health and Human Services. Lygeia stands as the Ringmaster of the show, her hair waving behind her and becoming the logo for HHS. She stands balanced upon an old-fashioned printing press. She stated in her speech to the crowd that we are in a time very similar to the reformation, where tools of technology can create great information access for the citizenry. So like a carnival of old, piles of one-sheet posters are being printed. But instead of “the circus is coming to town,” you read: “HHS Public Comment is Open.” In Lygeia’s left hand she shows one of the posters to the audience. In her right hand, she presents the crowd an I-pad using a twitter app to spread the same message. She is willing to use any tool available to connect with the populace and discuss the importance of the EHR. A provider stands in profile to Lygeia’s right. He represents the three medical doctors who spoke before the assembled. Moderator Douglas Kamerow, Chief Scientist of RTI, Ed Glynn, Ambulatory Medical Director of Informatics at Bon Secours Health system, and Jonathan Wald, Director of Patient-Centered Technologies at RTI. They become the plate juggler. Each plate is emblazoned with the logos of their current or prior workplaces. These plates fly through the air while the doctor tries to keep them all afloat. He must focus so much attention and energy on his work place that little is left for participatory medicine. But within his scant free time he is here and he is upholding the idea of patient as partner. He realizes it would be easier to juggle so many plates with another set of hands. To the far left and behind the printing press, a patient balances upon a unicycle. He is holding his IV tower as balancing pole. His face is stern, and he stares with intense concentration. His act is a solo act and if he falls the consequences are dire. When my husband Fred was in his first hospitalization, he could walk with help for about a week. Each day he was encouraged by the nurses to use his IV tower as method of support as he limped down the hall, as we waited in vain for a walker that never came. When we finally transferred to another facility it was made clear to us that we should never use an IV tower for balance and support. That was against fall prevention guidelines. The second hospitalization staff realized patient care is not a solo act, for the provider or the patient. This must be a team activity. How to be an Effective Advocate Oklahoma CAH Conference. “ He spoke about rural health throughout the nation, and specifically in Oklahoma. He began to talk and I began to paint. Brock spoke about the hopes and fears that many rural health providers have regarding pending legislation: ARRA, HITECH, Affordable Care Act, and the Ryan Plan. The worries and concerns strode back and forth across the partisan political divide. He was painting a rather undefined horizon with his words. I began to recreate his imagery in paint. I could feel the storm of worry and uncertainty as each bullet point within his slide set shot across the screen. An ominous sky began to spread over my canvas. 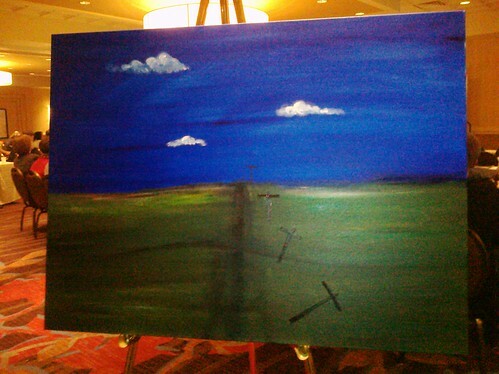 It is blue and relatively flat unlike virtually every over sky I have ever painted. Traditionally my skies are painted with data swirls and filled with symbols of deliverance via cloud technology. This sky is still. A few small clouds are isolated within the piece and sprays of far off rain descend. This is an Oklahoma sky and the storm is coming. This is rural Oklahoma with too little broadband access and no cloud EMR coming to aid small critical care clinics. Below this sky, a field smeared with the promise of winter wheat fills the lower half of the painting. A poorly defined road disappears into the distance. It is barely a smudge of dirt or gravel. The infrastructure is failing and underfunded. Beside this forgotten road, Telephone poles grow small in the distance. At the end of the line, a patient speaks urgently into the phone line as it has morphed into a stethoscope. The patient is too large for the distance and scale of the piece. My sister chuckled at his size, “Isn’t he a bit big?” I answered her, “You know I have never been overly worried about perspective nor scale nor following the rules of art.” He is big because he must be. He is the patient and his need is great. The telephone poles in foreground have fallen down. Communication cannot be sent if there is no method of support. A doctor kneels, trying to hold the overly heavy stethoscope. He is attempting to listen to the far off patient. The doctor is far too small and straining under his load. He is alone and understaffed and trying to utilize a broken system. 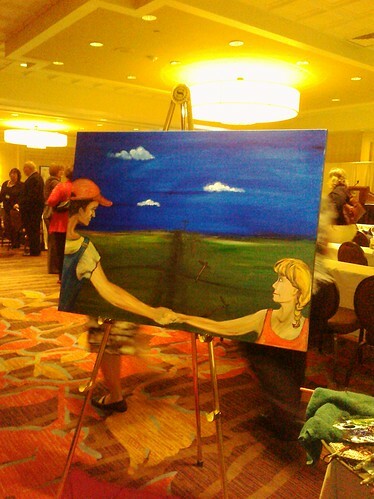 To the extreme right and left of the painting a farm couple spans the canvas. The farmer is concerned. He stares in stark profile, stretching his hand across the road. He clasps his wife hand and she looks up at his solemn countenance. Her arm also strains to connect with him. They must travel upon this road. They are “off to see the Wizard,” and a tornado is rapidly approaching. This was the image of the farm family I heard in Brock’s speech. This is the strain of a system where families must often travel many miles to get care. 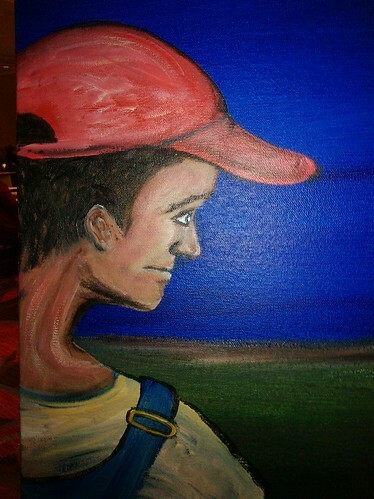 Is the farmer’s back to you and his arm unnaturally twisted? Or is he facing you and his neck is craned at an impossible angle? This image is wrong, twisted and backward, representing laws passed by bureaucrats coming from districts that represent a less than 20% of a rural population. Look at how gently this farmer holds his wife’s hand. It seems as though she is descending from a buggy or being greeted as a bride. Look how young they seem. But perhaps they are truly elderly, and this is how they see themselves through the mists of time. Perhaps they have been left behind on the farm. Valiantly they try to harvest wheat, bending damaged knees above the combine seat or clasping the feed-truck wheel using fingers swollen with arthritis. Their need is great and their options few and without the funding provided by Medicare or Medicaid they are one bad harvest away from abject poverty. As the day continued I heard about HIT glue. The adoption of Electronic Medical Records and a fully functioning Health Information Exchange has created a great deal of hope among providers. I heard Susie Cook, RN explain the change process that medical practices undergo as the implement a new EHR (Electronic Health Record) system. She mentioned the four types of personalities the staff tends to embrace. First there is the Victim. This is often an older or conservative nurse not confident with using new communication technology. 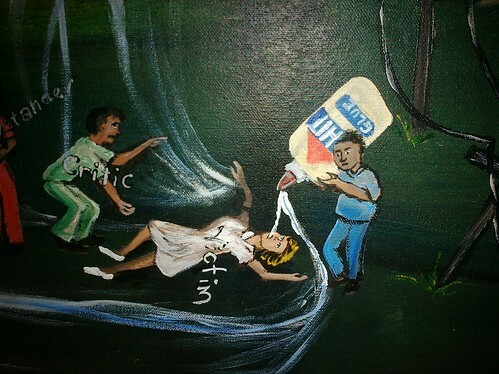 In the painting I depicted her fallen upon the ground wearing the classic white nurses dress while virtually drowning in the flow of HIT Glue. Beside her is the Critic who offers no help and only hinders. Susie says this person’s stance must be stopped as soon as possible as it can bring down the whole team and does not help the victim. Next to the critic is the bystander. She stands with her eyes rolled to the side and her arms across her chest. She will not hinder nor will she help. Finally there is the navigator, who stands to the far left. He wants to help and has his hand on the wheel. He will sail the EHR ship away from the overflowing stream and into calmer waters. 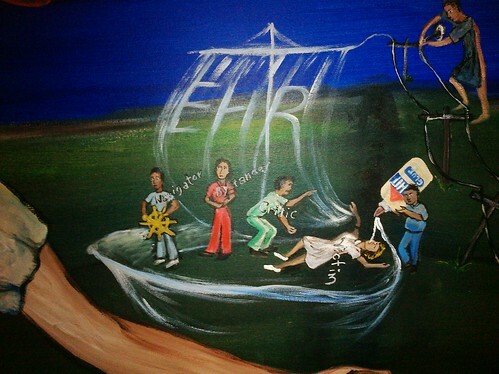 The EHR ship is a sailing vessel. It is exploring and testing the waters, it is just beginning its journey. As I explained this ship imagery before the gathered crowd in Oklahoma, I mentioned my first thoughts at being asked to speak on April 12th 2011. It was almost 99 years to the day that the Titanic sunk. When I speak about HIT I often ask what sunk the Titanic. Most people respond an iceberg. 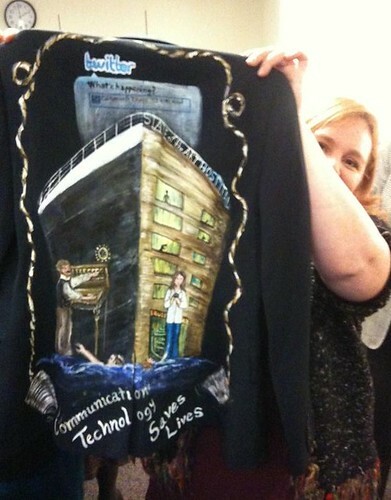 I say no, failure to correctly use wireless communication is what sunk the Titanic. There was a wireless set on the Titanic and if they had only used their information exchange correctly, over a thousand lives would have been saved. So when we talk about the painful process of EMR implementation, we must think of the lives saved. When we talk about the desperate need for a fully functioning HIE, in your mind’s eye I want to you to think of those brave navigators who with a compass and the stars set sail for unseen shores. That is where we are right now and we have a whole world of better health care to discover. And that quote became the foundation for the painting I created today. This morning, I dressed in my nicest business dress and carried my French-box easel in one hand and my brief case filled with paint in the other. I climbed the carpeted steps of the Capitol Hilton Hotel and stood in line with those that came at 8:30 am to listen to sixteen speaker views on the quality chasm in medicine. They checked me in, and I grabbed my packet. 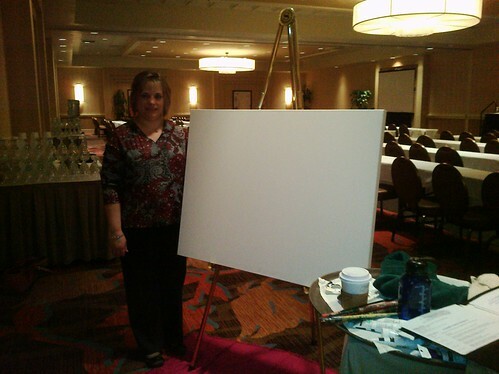 I rapidly walked to the back of the room and began to set up my easel. I set up next to the cameraman, as I too had come to create a picture. Several nice Health Affairs staffers looked at me quizzically. A couple of them even came over to talk with me. But no one stopped me from painting, and that was good. I was doing something a tad subversive. I had not been invited. If it hadn’t been for Trisha Torrey and a blog post she had written, I would have had no idea this meeting was taking place. 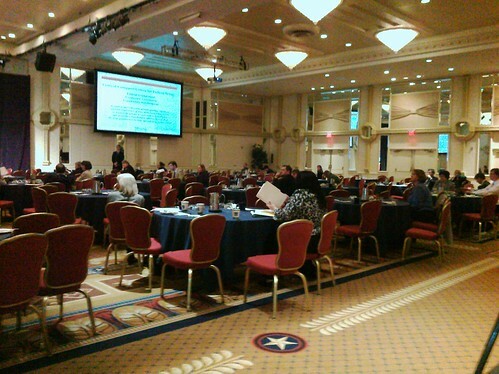 On March 31, Trisha Torry wrote a blog piece “Time to Recognize Us Not So Invisible Patients.” She had been invited to attend a briefing by Health Affairs called “Still Crossing the Quality Chasm: Update on the Progress in Improving the Quality of Health Care.” She was rather astounded when she read the speakers list. As Trisha phrased it “VERY impressive list of speakers. Except.... No patients. Not one individual who can speak for patients from a patient's point of view.” Trisha‘s blog is well-read in the patient community. She had hoped that with her post Health Affairs would change their lineup and include a patient speaker. She also was hoping local DC patient advocates could attend if we were only made aware of the proceedings. Health Affairs Briefing: Patients Becoming Less Invisible. Here she stated: “Eventually I received an email from Sue Ducat, representing Health Affairs, telling me that one more 'expert' had been added to the panel - someone who has proved her chops in patient safety.” That speaker was Diane C. Pinakiewicz, President of National Patient Safety Foundation. In addition to this speaker there would be a patient in the audience; Ilene Corina, President of PULSE of NY and long time participant of the National Patient Safety Foundation Patient and Family Advisory Council also presently a member of the NPSF Board of Governors. And in the back of the room, I would paint. I was very happy that Susan Dentzer, Editor-in-Chief of Health Affairs, mentioned early on that the Twitter hash tag was #HA_Quality. A nice twitter commentary ensued, which allowed far more patients to participate. 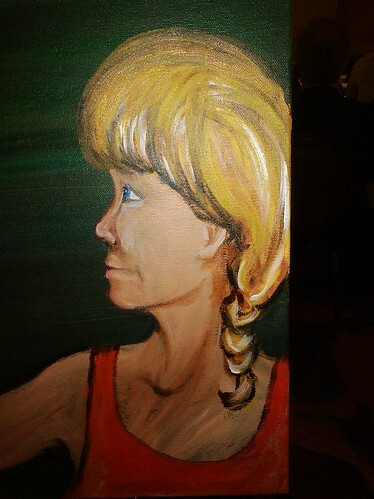 So between brush strokes I would periodically tweet and enjoy the give and take of social media. At one point Christopher Fleming, Social Media Manager at Health Affairs came up to me and asked questions about my work. He would be the only Health Affairs staffer who gave me a card. I told him I would send him my blog as soon as it was completed and thanked him for his frequent tweeting. I quickly painted the cliffs, the chasm and the sky. Soon we began to hear about plumbing. 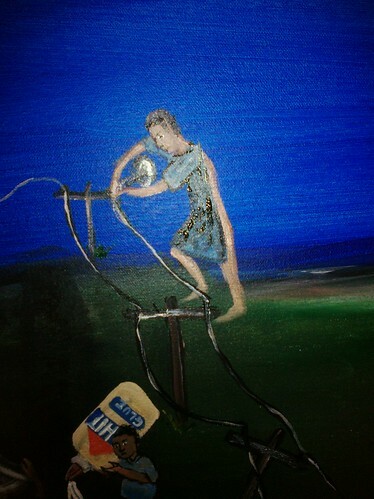 So pipe works began to emerge on the left side of the painting. This was the patient side. A number of patients upheld the pipe works and tried to curtail its uncontrolled gushing. 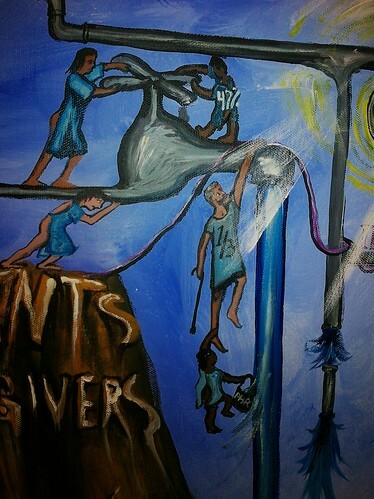 An elderly figure dangles from the pipe; he represents the 1/3 of the senior population that gets to access care. A child dangles from the man’s foot. The child is holding a bucket under the gushing spout. That bucket is labeled PHR. She is trying to take some information out of the data stream as billing codes and data gush into the valley bellow. 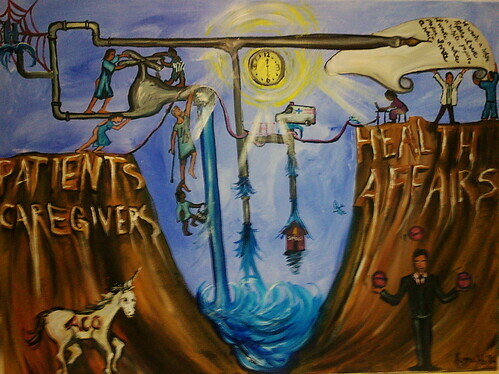 Above him a child valiantly tries to turn the spout; she represents the 47% of children who can access care. Throughout the pipe works are areas of disruption that point to systematic failure as data and services drain away from their needed destinations. Safety Net Hospitals, Ambulatory Care Settings, and medical education are suffering from a lack of clear communication between providers and patients. 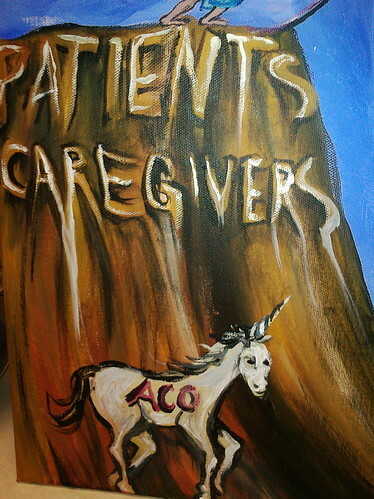 In the lower left area ACO is depicted as a mythical beast, for that is how a panel speaker defined it, as she begged the moderator to forgo asking her to comment on Accountable Care Organizations. As I tweeted this description on Twitter, @faisal_q or Faisal Qureshi responded, “@ReginaHolliday Mythical? hmm... the monster is real and it’s right in front of us.” So I painted an ACO unicorn because our pop-culture often depicts these beasts in glitter and rainbows. And they can be positive--Kaiser Permanente is an example of a conceptual ACO. Elizabeth A. McGlynn, Director of the Center for Effectiveness and Safety Research at Kaiser Permanente gave a great description of this type of care model. She explained that while calling to make one appointment she was encouraged to schedule her mammogram and other needed tests. 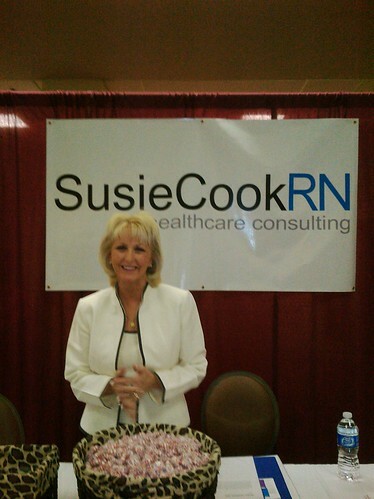 She described in glowing terms the power and patient-centered nature of accountable care at KP. But unicorns can be tricky. They are wild and complex and cannot be tamed by man. People often forget they tend to gore to death those humans who are well-versed in the ways of the world. 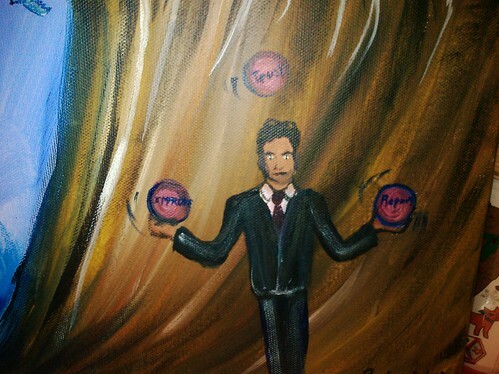 Across the chasm on the right side stands an executive juggling; He juggles the balls of trust, improvement and reporting as they circle in the air leading to RPI (robust process improvement). I wondered as I learned about this new acronym if people considered that failure to follow these simple measures, for example hand hygiene and better hand-off communication, could lead to that much sadder acronym RIP. 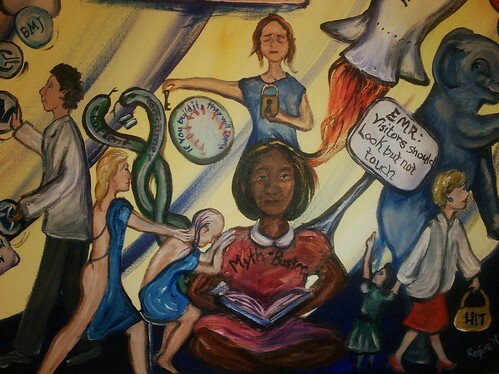 Above the juggler, providers hold up a philosophy scroll. A doctor proudly stands in the center. To the right, a nurse or tech faces away holding up an end of the parchment. On the left side, an informatics professional types away while balancing the sheet on her head. The plumbing from the right side of the panel becomes an old-fashioned dip style pen. And these words are written in cursive: “I wrote a white paper. I wrote a white paper…” These words a cascade down the page like some academic Jack Torrance. Again and again, as the speakers spoke I would hear about the papers they had written. These papers seemed to be the passport to speak in such an august setting. And I sadly thought of all the patients who would never write a white paper, but had such important things to say. We had a break at 10:45, and I saw via email that Ilene was trying to get a question asked during Q&A. I too had raised my hand for a question, but they had been taking few from the audience. After the break and during the Q&A of the next session, the moderator mentioned that she would like for Ilene to get a chance to speak and ask her question. Ilene asked what ways were the panel members involving patients directly in bridging the care chasm. In response, one panelist mentioned that they were now involving patients in all their hospital panels. This was the first time patients were referred to as a team member and not as a participant who needed to have better compliance. After 12:20, the session was running over, but the sun rose on this painting. At this point the panel “Where Do We Go From Here? “ began. I wondered if they had any idea about the Buffy song of the same title. That is the song we used to dedicate the mural 73 Cents. That is the song I am singing on the NPR broadcast of November 9, 2009. My answer to the question was simple. Patients and caregivers must have access to their own information and must spread the word about the need to treat patients with dignity and respect using every form of social media. Soon Peter J. Provonost from John Hopkins University began to speak. Finally, we saw a picture of a patient. He showed the picture of a baby. Her smiling face reminded me of the Teletubbies. As any parent who once had an 18 month old can tell you, babies are just mesmerized by the Teletubbies and the golden sun with a baby’s face. Oh, how it giggles and they giggle and the room fills with joy. So there is a painting of the sun in this piece. And that sun is also a clock that marks the time that the smiling face of Josie King stared out at us twelve feet tall upon the screen. I was sad and angry, because by this point so many people had left. Josie’s face should have been the first slide. This panel should have been the first panel. That would have centered this day and this event. And that speaker that Trisha fought so hard to have included should not have been the last to speak. Finally after the room cleared, I was the last to leave the hall as the hotel staff cleaned the room of the remains of breakfast. Patients had been left for the end, and it seemed like an afterthought.